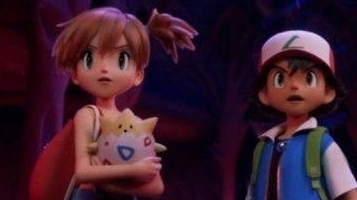 We’ve known for a while this year’s Pokémon film is a CGI remake of the very first anime movie – the one where Mewtwo breaks bad and loads of Pokémon get cloned. Now, we’ve got our first peek(achu) at how it looks. Today’s trailer shows off how the original’s 2D anime visuals have been translated to 3D CGI. It’s an… interesting conversion, which reminds me of some of the early CGI work done on Pokémon trading cards. Key scenes from the original film are shown – Pikachu slapping its clone, Mewtwo in his armour (more on that in a minute), along with the film’s familiar cast of characters: Ash, Misty, Brock, Team Rocket. Of course, this is an entirely separate movie and nothing to do with the other Pokémon film due out in a few weeks – Detective Pikachu. Armoured Mewtwo, then. While the rest of the film looks to recreate the original as closely as possible, Mewtwo’s suit of Team Rocket-made cyber armour has been given a redesign. A recent Japanese trademark for the name “Armoured Mewtwo” suggested it will be getting a big merchandise push – and even more exciting (for me), code for a “Mewtwo_A” was recently found in Pokémon Go’s files, hinting at an upcoming tie-in release there.